Driver side lower front arm has a bit of a refurb and is ready to go on. A bit more than I anticipated but done none the less. I love tools. Even the kids the work for me. I absolutely don’t need some of the high end stuff I get but I like to use good tools and I more or less collect them. Things I use that may not be available anywhere but the tool truck. 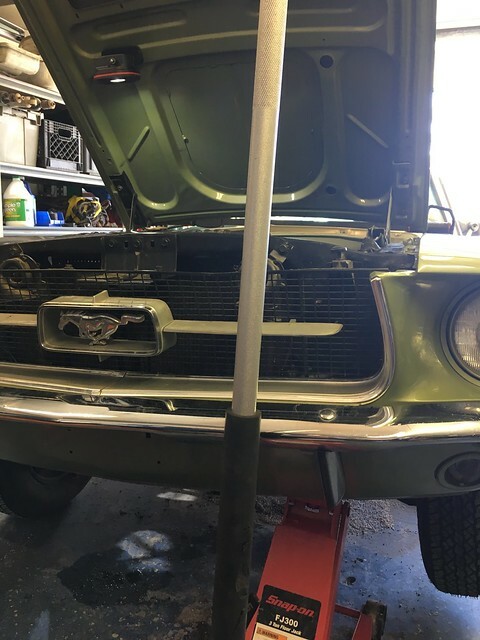 You certainly don’t need tool truck tools to work on your classic Mustang (or pretty much any classic). 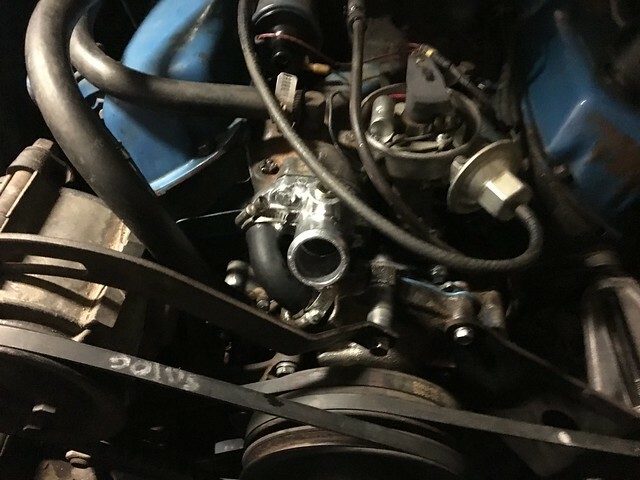 Way back when I did an engine swap in the first car I owned a 69 Datsun 521 truck with a basic set of Craftsman hand tools and a rented engine hoist. A good set of combination wrenches, pliers, screwdrivers and sockets will get most things done along with a hammer or two and a voltmeter. These days a set of Harbor Freight or Kobalt tools and you’re good to go. HF has come a long way since I first visited the Tacoma store nearly 20 years ago. There are still some things that aren’t so good at HF. Here are a couple. The presses are a good value. The press plates are junk and potentially dangerous. There are many stories around the web about them breaking. Here’s mine. As the onion of the suspension keeps getting pealed back a usual amount of unexpected issues crop up. I’d hoped a long day, 10-11 hours would get it all sorted. 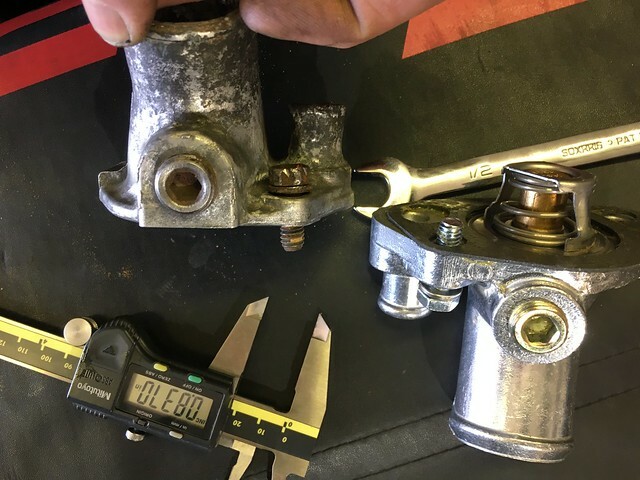 Seized parts, as expected in a car this age and stubborn disassemblies add to the time. Been a serious last couple of days. I got the cooling issue mostly sorted. Runs cool but still has a stall issue. The stall issue I can trace to sudden accelerations and sudden stops when hot. If I just mosey around it’s fine. I put another 20 miles or so on it. Still a death trap over 40-45 mph. At 60 it goes batshit crazy on the front end. I’ve found the reason(s) but this post is about finishing the cooling system. I’ve got a VDO gauge and sender on the way from Summit. I’m half temped to put it in place of the stock gauge in the dash. In the meantime I’ll tag the sensor into the heater hose outlet on the manifold. 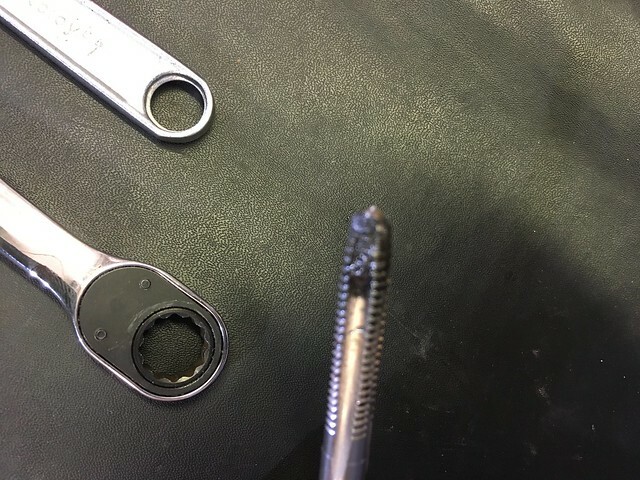 The fitting is pretty hammered now so for the time being I’ll drill out the top, tap it with 1/8″-27 NPT (just got a smokin’ deal on an almost new top quality SAE tap and die set) wire it up and let ‘er rip. For now I’ll cowboy the wiring and basically put the gauge on the hump above the shifter lever. I’ll sort out mounting later but I need to know exactly how hot it’s getting and what kind of rise it has. When I was racing this was the kind of thing we logged every session. Except when I ran in the Nascar Whelan All American series where no data of any kind was allowed, even on practice days. I’d come from more than a decade of logging at that point. I turned up at one of my first official practice days with an AIM EVO with 7 or 8 channels and at pre tech was told to go home for the day and remove it for when I turned up for the race the next day. Here’s the fitting that will be modded, it’s been cleaned up since that pic (pre cooling system revamp) but it’s going to need a new one. In the end I’ll either assemble something from parts at Pegasus or get another of these and mod that. You resto mod guys could find a lot of good plumbing bits at Pegasus. They are a go-to for many racers for race plumbing and wiring. 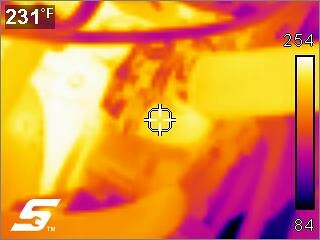 With the cooling system revamped, a test drive and new thermal images shot it looks like I’ve got most of it solved. Except for the stall problem. Looking around for tips I ran into what could be the issue in the FSM. The dashpot isn’t really working. The dashpot acts as sort of an automatic door closer for the throttle. Just as a door closer makes sure the door doesn’t slam shut, the dashpot makes sure the throttle doesn’t slam shut causing a stall. That’s new to me. Running carbs in circle track or shifter karts we didn’t use them. This one is hammered. It doesn’t even pretend to dampen the throttle closing. I did need to adjust the idle speed screw and the mixture screws and that helped with running in hot conditions. The acceleration/stop test will stall the car every time once it’s warmed up. I’ll get a new dashpot and take it from there. The final tests are to check the timing and vacuum. The timing is pretty easy. It’s a bit more advanced than it was when I checked it the first time I fired the engine. Or I got the reading wrong. I went to adjust it and the distributor didn’t easily turn so I left it to another time. A vacuum test is easy. This is another one of those times when the Harbor Freight test tool is a go-to. I tag the tester right to manifold vacuum connection. It’s the nub that’s covered by the cap. The other two go to the smog system and transmission modulator. The reading is in the ballpark. I couldn’t find it in the FSM but searching VMF Woodchuck had posted the specs. It’s about mid window at 19″ but it’s steady. 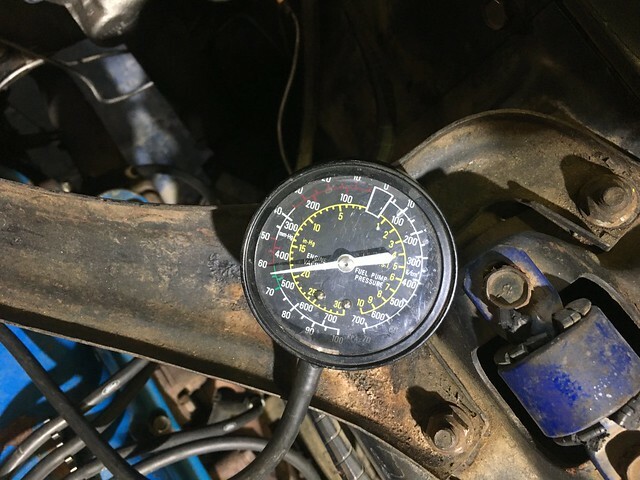 It seems a bit more tuning and getting a proper temp reading is going to be the key to reliability running when it’s 105-110 outside right now. I’ve really soured on reproduction parts. Particularly Scott Drake parts. The few I’ve purchased are crap. The function is fine but the finish and fit leaves a lot to be desired. Particularly for the price. 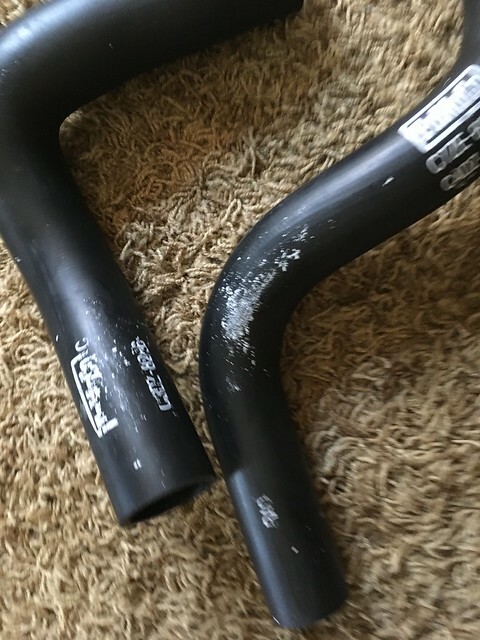 The latest disappointment/debacle (and the last time I get that brand if I can help it) is with the radiator hoses. Rather than get plain old Gates from NAPA or Rock I opted to spring a few bucks more for labeled reproduction parts. Labeling that was fubar even before I opened the package. I’m sure CJ would have made it right and taken them back before I put them on but that’s besides the point. I like the vendor but they carry so much Drake it’s going to be difficult to get some things from them. At this point it’s a driver. I wanted to make it period correct appearing but those parts many times are junk. The hose in this case seems good quality, thick, stout molding but I can get the same thing from a Gates or Dayco. Done. 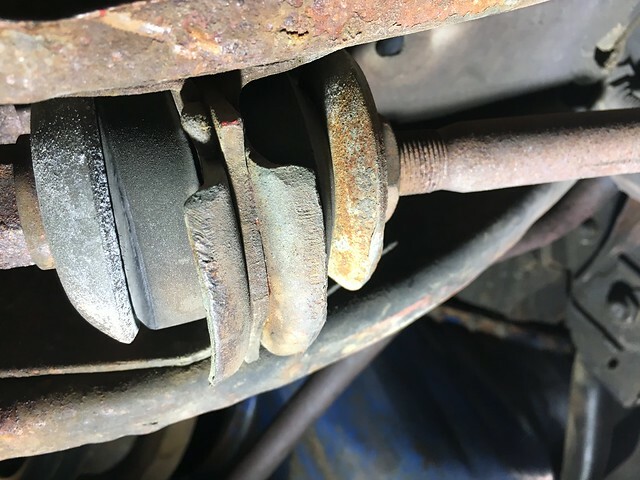 Works well, car still runs well. It’s got some leaks. 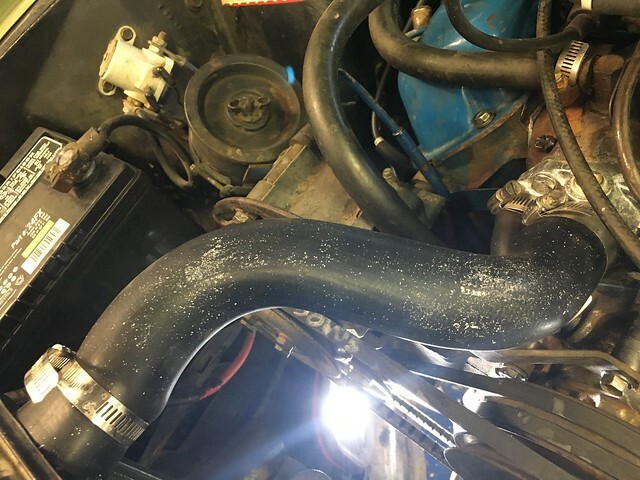 Each end of the top and bottom radiator hoses leak. Imagine that, near 20 year old rubber hoses that sat for 11 years then had corrosive back flush solution run through them have started to leak. Who’d a thunk? I was originally going to order the hoses with the rest of the parts for the refurb but thought if there was a chance I was going to have to tear the whole thing down right now anyway I didn’t exactly need new radiator hoses. And I’ll need to the get the original style clamps to be period correct. And the radiator drain seal has failed and it leaks too. I’d say that’s pretty minor in the big picture, as long as I get them fixed and not really drive it until then. When you’re replacing classic or even older parts with current replacement parts there are bound to be some differences. We see this in the production cars that are converted to race cars/trucks and pre runners. 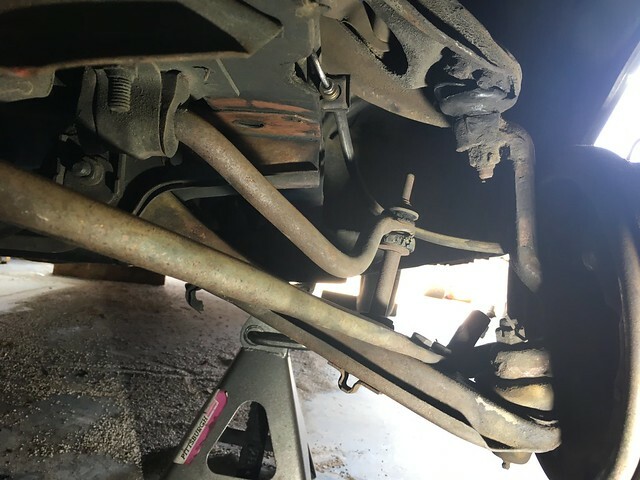 In those cases there isn’t the mandate to maintain a period correct vehicle and many of those parts are modified, fabricated or from other like uses in that make. The lower cost generic thermostat housing/outlet is the same Four Seasons aftermarket that Rock Auto sells. It’s also thicker at the mounting boss/bolt hole than the original or the 87 Ford part that was on the car. 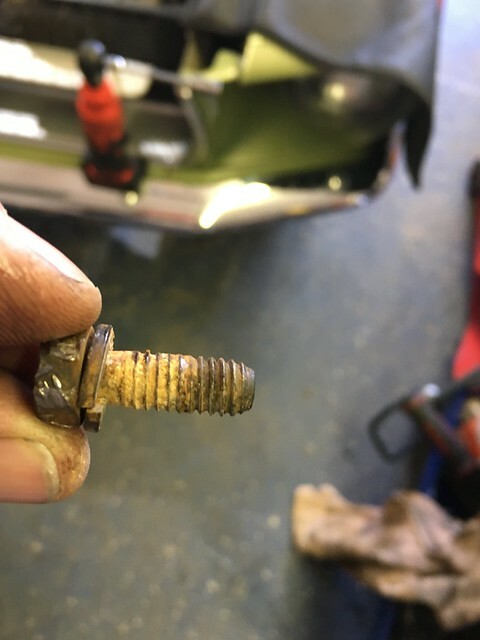 With the wear, previous leaks and rust the existing bolts that came off the part and the new bolts I replaced them with weren’t long enough to catch enough threads. 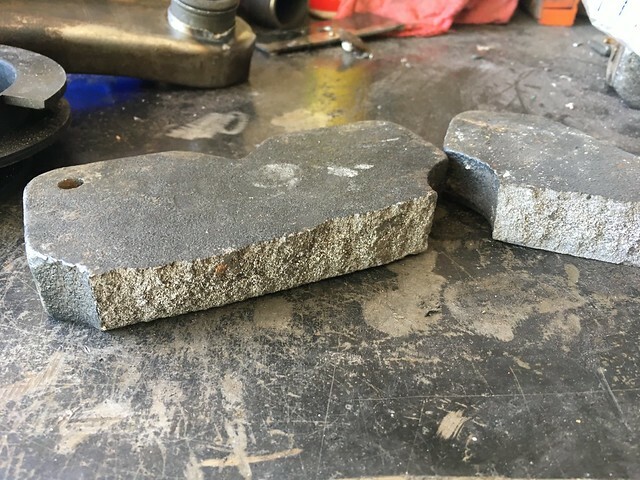 The originals were too hammered to use again anyway. The one that didn’t have the rounded head was caked with corrosion and hardened rust. IOW metallurgy happened. 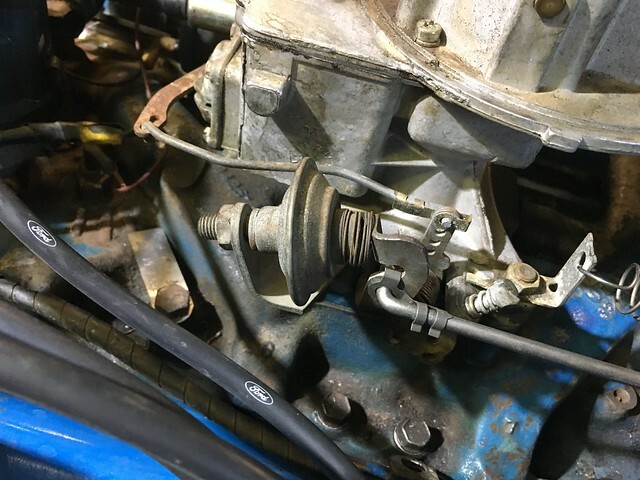 To get a match that would work on the new part for the bolt length the replacements are going to need to go another 1/4″ or so into the manifold thread. The hole is plenty deep it just won’t allow the threads to run down that far. I only chased them to about what I needed for the shorter bolts. Now I have to chase the rest. I use a cutting tap for this because it’s hardened and corroded. In fact I rarely use a chaser and have never had any issues damaging existing threads. 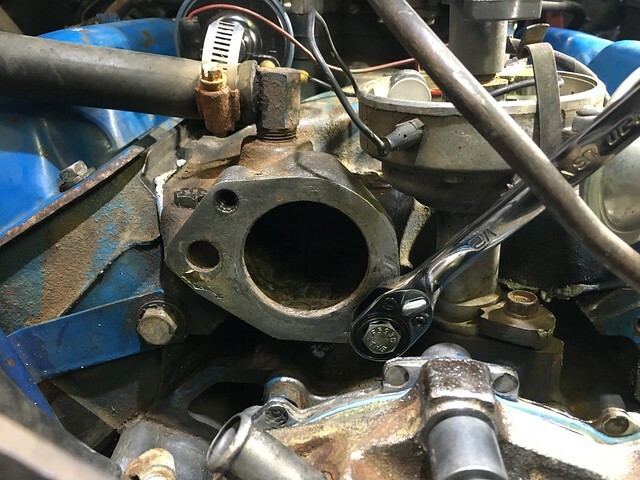 A chaser also won’t recut a stripped start of a tapped hole. Here’s what I pulled out of the top hole. The bottom hole is harder to get to. 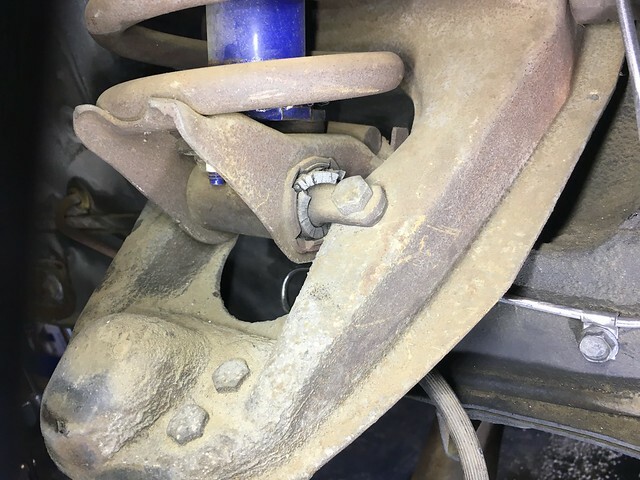 Since the entry wasn’t stripped I could use a bolt. The chaser I have for that size is too long. 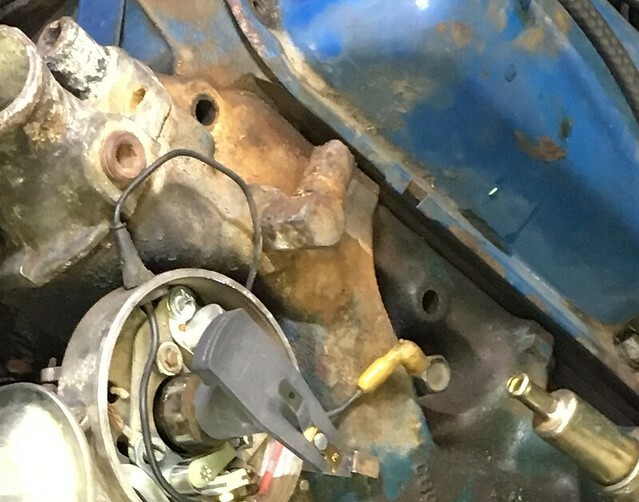 I chased them when the manifold was off so clearance wasn’t an issue. I used Rapid Tap and ran the bolt in and out using a ratcheting combination wrench then blowing the gunk out of it. 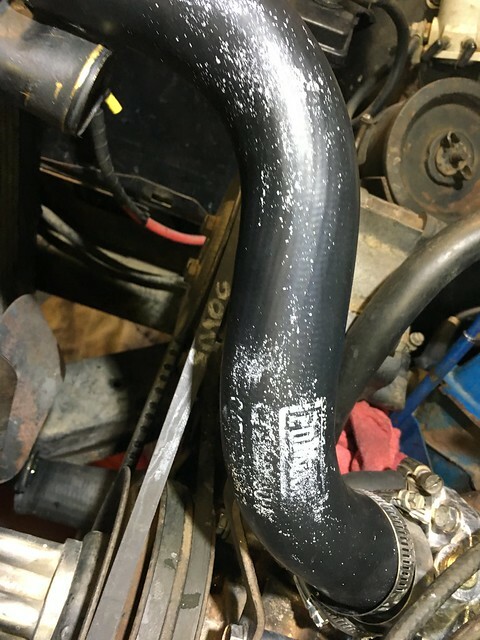 If you are doing big engines or are a pro shop you’re likely using a pressure filler so you don’t get air pockets in the cooling system during a fill. I don’t do it enough to justify it though when I was racing the water/water wetter came out after every race, sometimes during an event we had to do it to work on the engine or during tech. These days not so much. You can “burp” the air from your cooling system on fill using a jack. How I do it is jack the car up, radiator cap removed so the filler neck is the highest point of the cooling system. I top up the system with water only until I know there are no leaks either inside or outside the engine. I start the car and let it run for a few minutes. During the run I add water as it lowers in the radiator. When the radiator no longer needs water I watch it and can see air releasing from the system. Don’t let it run too much longer than you need to release the air or I will start to run over as it gets hotter. At that point I cap it, drop the jack, check for leaks then do a road test. After the test I make sure the water is still more or less topped up. If it’s not it means there is either a leak, you didn’t get all the air out and had a larger pocket or it’s leaking into the engine. 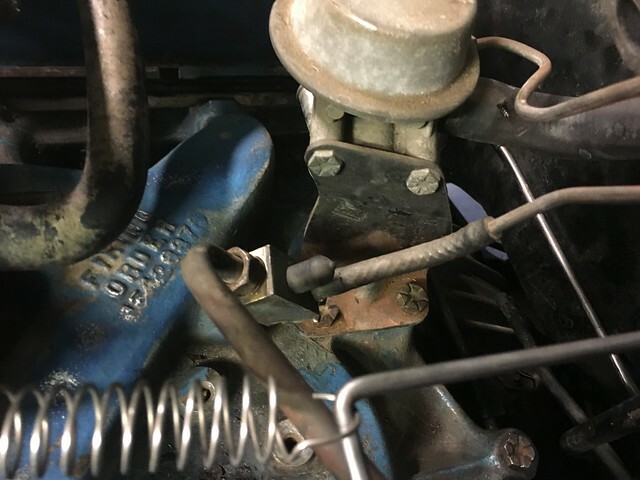 You can check to see if it’s leaking into the oil by reading the dip stick and looking for that blueish sheen in the oil or in the radiator. If so you’re going to need to figure out where it’s coming from because it can tank your engine. After I got a mile or so on it I brought it back in for some thermal images. Remember from the last time the images showed massive heat at the thermostat housing/outlet. It looks better this time, not as much heat trapped at the base of the housing. That’s in an ambient temp over 110* F. When you look at the contrast as well it doesn’t seem to be as much heat soak into parts around the cooling system. Except for some leaky hoses mission accomplished. Other than the hoses the next thing will be the power steering rebuild and suspension refresh. It’s about the resurrection of a 67 Mustang, type C San Jose built car. Bone stock.